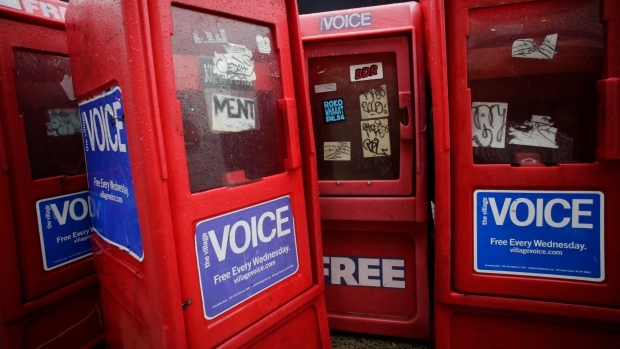 NEW YORK -- The Village Voice, the Pulitzer Prize-winning alternative weekly known for its muckraking investigations, brash political reporting, exhaustive arts criticism and anxiety-laden cartoons, is going out of business after 63 years. The paper's publisher, Peter Barbey, announced Friday that the pioneering paper is ceasing publication entirely because of financial problems, a year after it stopped circulating in print. "This is a sad day for The Village Voice and for millions of readers," he said in a statement, released after the closure was announced to the newsroom staff. Barbey, also president of The Reading Eagle newspaper in Pennsylvania, bought the Voice in 2015 in an attempt to save it following a series of ownership changes, staff departures and audience and advertising losses that had left the publication in a state of perpetual peril. He tried to stem its losses be giving up print publication last summer and publishing only online -- a move that removed the paper from the sidewalk distribution boxes that were a fixture on New York City street corners for generations. It failed to stop the financial bleeding. "In recent years, the Voice has been subject to the increasingly harsh economic realities facing those creating journalism and written media," Barbey wrote. "Like many others in publishing, we were continually optimistic that relief was around the next corner. Where stability for our business is, we do not know yet. The only thing that is clear now is that we have not reached that destination." The company said eight of the Voice's 18 remaining staffers were laid off Friday. He said staff members have been working to ensure the print archive of the Voice is made digitally accessible, saying an online archive "will offer coming generations a chance to experience for themselves what is clearly one of this city's and this country's social and cultural treasures." The Voice was the country's first alternative newsweekly, founded in 1955 by a group that included writer Norman Mailer. It once had a weekly circulation of 250,000 copies and was a home for some of New York's best investigative journalists and music writers. It has received three Pulitzer Prizes, for editorial cartooning and feature writing in the 1980s and an award for international reporting in 2000 for a series on AIDS in Africa, among many other awards.